Guess who has a new spot to call her own? Following up on this post, here is the final result. I absolutely love it and I think she likes it too! I plan on making lots of memories right here. I admit, I was a little leery to mess with the table. I'm not usually in the habit of attacking pieces of furniture with a circular saw! But I'm so happy I went ahead and re-purposed the existing lovely but damaged table it into something we can really use everyday. The damage is still there of course but thats okay. As you can see, I cut the legs down, painted the whole thing and re-glued the shorter legs back on. Now we have a great space to play with Agatha that looks beautiful and fits right into our living room too too. Yea for projects that go just the way I plan. Oh man! I did NOT think that would turn out like it did! Nice work, I bet she will love having little tea parties there. It looks like a cloud! So happy and fun. Love it. Looks absolutely lovely! 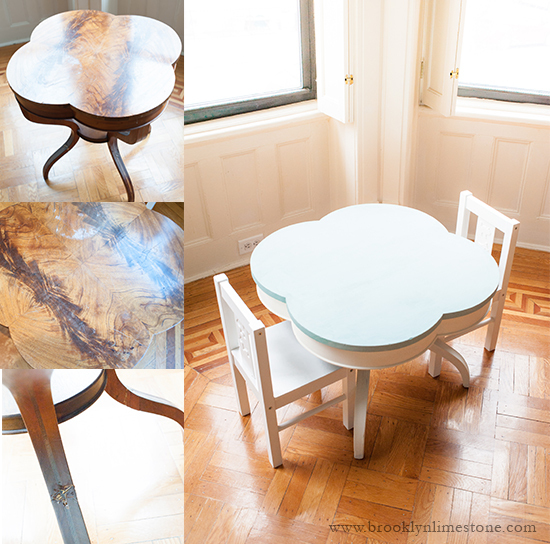 I really do love the shape and it's the perfect balance between being a kid's table, yet refined. Adorable!! The table and the baby! Yes, you will have many memories crafting and coloring there. Our little table is in our kitchen and will be missed as our little is getting to big for it. http://www.littlemomentssmalldetails.com/?p=409 I think it would look so good in that room! Oh those are adorable! I'll have to check Ikea for those on my next trip. This turned out totally adorable! Really love that play table! Great job! oh this is adorable! love he colors and shape! 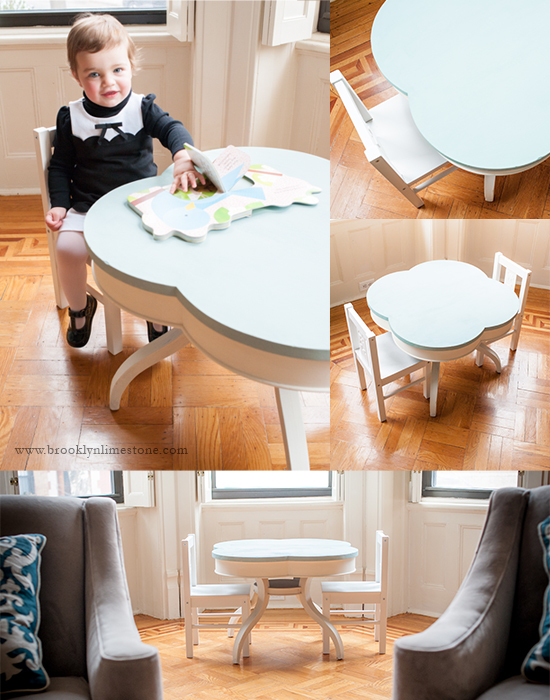 A cute little table for a little cutie! Love the shape and colors. It came out great! Looks like shes in love with it as much as you are! That is the cutest play table I have ever seen. Perfect! Your little one reminds me of the Eloise Wilkin babies- so sweet! It's so sweet and perfect! Adorable! 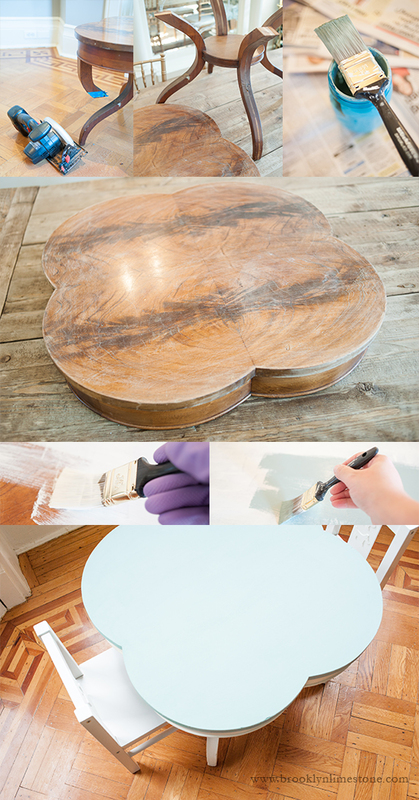 The shape is perfect for a little girl's play table! Turned out awesome! I seriously think she gets cuter every day. That lemon video was precious. Oh, my lands! I just found your blog, quite by accident, and I totally have your kitchen pinned on Pinterest! I have sort of sinned and coveted that kitchen of yours for a while now, and then... boom! I find the blog of the girl who actually owns that kitchen, and this is what I have to say: Your glossy, stainless steel fridge with NO FINGERPRINTS, SMEARS OR SMUDGES had me at Hello. It may be the very reason I pinned it! (Yes, welcome to my crazy; I swoon for refrigerators that aren't covered in smudges and fingerprints, like my stainless steel beast is.) And this little table that you painted is darling, and do you think we could get together for coffee sometime, so that you could ask me questions like... oh, I don't know... "How about I redecorate your house for you?!" And I would stand up and clap and yell out, "Yes! Bravo!" Because I'm pretty sure that your style is exactly my style, only I didn't get the spiritual gift of decorating, as evidenced by the ugly throw pillows on my sofa from Walmart. Have a happy Tuesday. Your little one is so cute! I love how you have re-purposed this table. You've inspired me to make one for our Grand Kids. Table looks great! I love that shape. But that baby! She is too beautiful! !